Omron will be at Hannover Messe from 23 to 27 April, supporting the event’s theme of Connect and Collaborate by demonstrating its capability to innovate the future of manufacturing. Visitors to the Omron stand (Hall 9, F24) will be able to experience Omron technology supporting flexible robotic cells, data acquisition, data intelligence and AI realizing agile mass customization cells that shifts manufacturing from 'build to sell' to 'made for me'. 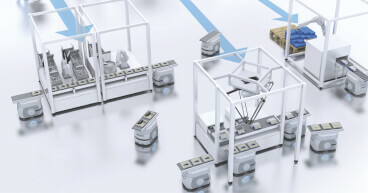 Omron will show how robots and machines can interact seamlessly to allow production runs to be easily and quickly altered to allow for fluctuating lot sizes. This enables production lines to be quickly adapted to changes in demand or to run specific designs with the highest efficiency. The demonstration will feature Omron’s mobile robots and fixed robots interacting flexibly to fulfil orders based on instructions entered through the local HMI or from a tablet using secure OPC UA communications. This smart, integrated solution emphasizes how machine intelligence, from individual processing stage to complete system level, enables flexible and reconfigurable manufacturing for optimized manufacturing that meets increasingly diversified consumer requirements. What’s more, flexible manufacturing is achieved whilst still delivering high OEE, maximum safety and excellent quality. This is realized by collecting, processing and visualizing data to solve any quality issues by tracing the source of problems in a reliable way at machine level. Omron controllers provide an easy solution for capturing information into a SQL database for local or secure processing in the cloud. This can then be used, for example, to realize predictive maintenance at machine level using the Sysmac controller’s libraries to integrate functionality for monitoring sensors and servos. In addition to the factory of the future, Omron will also be demonstrating innovations in artificial intelligence systems including the latest generation of its Forpheus table tennis robot and its autonomous vehicle driver monitoring sensor. These exhibits, based on Omron’s core Sensing & Control + THINK technologies will help inspire industry players overcome future production challenges by optimizing manufacturing. The latest version of Forpheus includes additional functions including the ability to serve, predict a smash and even communicate for a more immersive and enjoyable experience. And the driver monitoring sensor for autonomous vehicles, combines AI and sensing technology to determine the driver’s ability to take control of the vehicle. Hannover Messe is the world's leading trade fair for industrial technology, gathering together key technologies and core areas including research and development, automation, IT, supply, production, services, energy, and mobility.